Lift Ticket Comparisons: How Does Andorra Stack Up? Andorra has several resorts and each offers a distinct atmosphere, clientele, and price range. Arinsal, for example, is an excellent option for families, while Pas de la Casa is great for large groups and nightlife. But how do these resorts’ lift tickets stack up to other popular mountains around the world? As it turns out, an Andorra ski vacation is one of the cheaper destinations for avid skiers and riders. Below, we have listed one-day adult passes at Andorra resorts for reference. Chamonix Mont Blanc, more commonly known as Chamonix, is one of France’s most popular ski destinations. The site of the first Winter Olympics in 1924, Chamonix is popular with skiers. For adults, a one-day pass costs €65, roughly €15 more than a Pal-Arinsal day pass, which costs €40. However, when compared to other popular ski destinations, a Chamonix ticket isn’t exorbitantly priced. Still, you’ll get a better deal at an Andorra resort. Lilehammer is home to several popular ski resorts, including Skeikampen–Gausdal, Hafjell, and Kvitfjell. While more expensive than most Andorra resorts, these mountains don’t include wallet-breaking rates. A day pass at Skeikampen-Gausdal costs around €40, while Hajfell costs €47. Kvitfjell day passes cost €47. Grandvalira is the only Andorra resort that commands a higher price at €50 per day. While Vail might not have the prestige that comes with a European ski resort, Vail lift tickets are some of the most expensive in the world. A regular season adult ticket costs $215 (around €190), while seniors receive a generous $14 (€12) discount. Youth tickets are $148 (€130) per day. To compare, Andorra’s most expensive lift ticket, Grandvalira, costs €50, an absolute steal when compared to Vail’s prohibitive prices. Sometimes, it pays to ski in Europe. If you have your sights set on Vail, look ahead for deals and discounts. By many measures, Whistler Blackcomb is the largest ski resort in North America. This Canadian resort has the greatest uphill capacity and is the busiest resort, often drawing more than 2 million visitors per year. This popularity, however, comes at a pretty significant price. A one-day adult ticket costs $148 CAD, or around €100. Twice as much as Andorra’s most expensive resort, Whistler Blackcomb is still cheaper than other North American resorts – and might just be worth the high price. 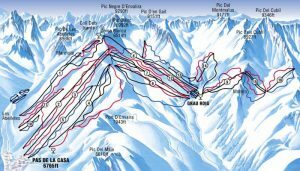 Another popular French ski area, Les Trois Vallees has been a popular ski destination since the mid-1970’s. Surprisingly, this world-class ski area has relatively affordable lift ticket rates. A one-day adult pass costs €62 for adults aged 13-65. While still more expensive than all Andorra resorts, Les Trois Vallees provides an affordable alternative. If you’re desperate to get to the slopes this season but are tightening the purse strings, then take a look at our recommendations for securing a ski holiday for less. Like millions of others we’ll religiously flock to the well known ski areas in the Alps, Rockies or US National Parks. But remember, skiing is aplenty in over thirty countries across the globe, so why not take a look at some of the alternatives. Firstly how about the major ski areas in Andorra, Grandvalira and Vallnord? These resorts are typically between £100 and £200 cheaper than the Alps’ equivalent, for a week’s half board package holiday in a 3 star hotel (based on a search of Crystal ski holidays), coming in at around £450 per person including flights and transfers. Or how about considering Jasna in Slovakia, which offer a week’s half board in a 3 star hotel including a 6 day ski pass for just £400. Add on your flight to Bratislava which would be around £200/return (including luggage and ski carriage costs), and you’ve got a rather good deal. Thirdly, let’s consider the Scandanavian options. Over the past couple of years it has become around a third cheaper to holiday in Norway, thanks to the strengthening pound to krone ratio. Whilst trips to this part of the world may still not be uber cheap, many Brits are now considering this exciting alternative, where great snow conditions are guaranteed. How many times have you gone to book your flight, automatically entering your nearest airport without giving it a second thought? The fact is that you could save £50-£100 per person, just by checking the prices from other airports in your region. Make sure you are also fully aware of all airlines that are currently flying to your chosen destination, as airline routes are constantly changing. Spending some time researching the flight alternatives can certainly pay dividends when it comes to your overall holiday cost, especially for a family trip. Most people generally look for accommodation that is centrally located within a ski resort. The main reason – so they don’t have to walk far in ski boots to the gondola. However, hotels are fully aware of this and hike up their prices for this simple luxury. If you look at the issue from the flip side you may be surprised to learn that hotels on the edge of town will often provide a complementary ski bus to take you to the lift and pick you up at the end of the day, to compensate. What’s more they may also offer you a ride into town in the evening, should you wish to sample the local ales. These hotels know that they cannot compete on the location aspect, so other things may stand in their favour, such as better facilities, pricing and service. Typically you can expect to pay £100-£300 per week less for the same standard of accommodation that is a 10 minute drive out of the resort. We checked this on a package holiday to Kitzbuhel in Austria. The search showed that if you are willing to be 4km from the centre of the resort then you will pay just £525 for a half board stay in a 4 star hotel in March, including your flights and transfers. Wherever you go in the world one thing is for sure, if you cook your own food then you will spend a lot less. Many will argue that a holiday means being waited on hand and foot, but if you are looking to cut costs then this is probably the first area you should look at. After all let’s remember that the main reason for a ski holiday is the skiing itself. Selecting a good standard apartment also enables you to be fully flexible with your eating arrangements, as well as enjoying the extra living space that you generally get over a hotel room. What’s more you’ll often pay for the overall apartment as one for the duration, rather than per person, meaning if you share with 2 or 3 others, then you’ll be quids in. You can typically find an apartment that sleeps up to 4 in a large resort such as Morzine, for just £500/week. An internet search on any resort should bring up a good choice of options, but you can always head to the resort’s main web pages too. If you decide to book all parts of your holiday independently then be sure to spend some time looking for the best transfer deals. Numerous transfer companies have sprung up in recent years operating right across the European resort network, due to more people looking to travel independently. Often you can select from a number of travel options, including shared mini-buses, private vehicles, and luxury cars. If you are willing to share with others, a transfer of around an hour from a hub like Geneva airport can cost from as little as £20 each way. Start with an internet search and you will see a multitude of choices appear. Our recommendation is to get a quote from at least 3 companies before securing a booking. In order to be able to make the most informed decisions when it comes to ski holidays it is important to know what is going on in the industry. Ensure you check out publications like ‘In the Snow’ (inthesnow.com), and ‘Where to Ski & Snowboard’ (wheretoskiandsnowboard.com), as well as websites like onthesnow.com. You’ll learn about the trends for ski holidays, new resorts and new runs that are opening, and where overall investment is going. You can also find out more about new gear, big events, as well as learning a whole lot more about individual resorts as featured in-depth reports are produced by ski travel writers. At Ski Resort Advisor we also aim to do our bit to help you along the way! Why pay the full rate in resort when you can pick up discounted lift passes before you go. Often travel companies will offer a small discount if you book your lift pass at the same time as your overall holiday. If you are booking everything months in advance prior to the start of the season then you may well benefit from bigger discounts directly from a resort’s own website. Typically in years gone by people have taken their holidays for 7 days, Saturday to Saturday or Sunday to Sunday, and in the past many hotels and b&b’s have only allowed these types of bookings. These days that model has all but disappeared in most countries, giving way to much more flexible holidaying. So make sure to check prices for mid week departures as big savings can be made, especially on the flight segment. Being able to pick and choose your dates can also allow you to look at short breaks and extended holidays without being penalized. You may also find that hotels will offer such deals as buy 7 nights and get your 8th for free. What’s more you could also consider several short trips rather than one longer one, opening up the possibility to explore numerous resorts during a season. If you are able to take holiday from work at short notice then it is a great idea to leave things until closer the time before making your bookings. That way you are able to take advantage of the last minute deals to fill hotels and planes. Literally hundreds can be saved, and you may end up at an exciting new destination that you’d never even considered. All major tour operators will offer big discounts on their holidays as the season rolls on, but if you are booking everything separately then contacting accommodation directly and asking for their best rate can often pay dividends. Leaving things until late on can also prove beneficial, in ensuring that you end up somewhere with good snow, especially if you are looking at early or late season trips. We’ve all done it – getting sucked into what everyone else is doing because we don’t want to be different. Yet taking the plunge, and heading for a lesser known resort can offer up a whole host of benefits. Think – no lift queues, quiet pistes, more authentic restaurants and a generally more unique holiday. You’re also likely to rack up the savings financially on just about everything. If you are interested in skiing in Andorra, the Skiriderexp website will provide you with all the information you need to organise your own ski holiday in the small but busy villages of Arinsal, Soldeu & Pas de la Casa Andorra. Andorra is wedged between France and Spain and offers the best skiing in the Pyrenees. Andorra’s is structured into seven parishes of Canillo, Encamp, Ordino, La Massana, Andorra la Vella, Sant Juli de Lria, Escaldes-Engordany. 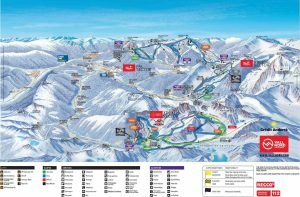 The three main ski towns are Soldeu & Pas de la Casa for the ski area of Grandvalira and Arinsal Pal & Arcalis for Vallnord. Andorra has 300km of ski runs or 187 miles. Total number of slopes 177, 15% green being the easiest followed 35% intermediate blue and 35% difficult red 15% expert Black. It has 6 Freestyle areas, 4 freeride areas, and 2 boarder cross. 112 lifts, 1482 snow canons which cover 40% of the skiable are of Andorra. Its lowest altitude is 1550m in Arinsal and the highest altitude of 2640m in Pas de la Casa.